Last year I wrote a review of some paper quilling supplies from Let’s Quill On after they sent me some of their goodies. Click here to read the review. Since then they have added quite a lot of products. A few months ago I wrote an update here with some fun new supplies such as the Ultimate Border Buddy. Today there are even more! 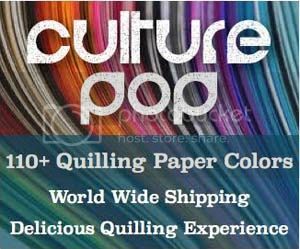 If you are unfamiliar with Let’s Quill On, it is a brand of paper quilling supplies based in India. They have innovative, colorful, quality, and fun quilling supplies! Although they are based in India, they do ship worldwide. Additionally, you can find some of their products on Amazon in the US. So without further ado, here are some of their fun new supplies! Anyone who is a follower of this blog knows that I am a big fan of quilled jewelry! This new jumbo jewelry kit is a perfect gift for anyone who wants to start making some! Excellent for kids or young adults, there are a multitude of projects! Even I’d like to get my hands on this! Not into jewelry? No problem, this fun filled kit is a blast for the young (and young at heart!). Make door hangers, clips, frames, cards, magnets, a tissue holder, and many more fun projects. Comes with everything you need. Click on the product in the link here to find out all the details! The handy electric quilling slotted tool and it’s alternate crimping tip now has an addition – the beading buddy! This looks like such a fun and convenient way to make paper beads, yay!!! Let’s Quill On has an amazing array of colors (and I love the way they showcase their individual colors in their online shop). They also have some fun specialty papers! Last time the new one was metallic edge. Now they also have fully metallic papers, crinkle cut papers, and glow in the dark!!! Let’s Quill On is great at publishing fun quilling projects! Have a browse at some of the new ones! 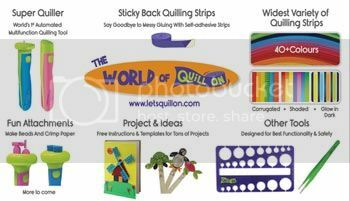 These are just a few of the multitude of fun supplies sold by Let’s Quill On. Make sure to check out their project supplies as well. They carry so many things to make into fun projects like rangolis, wooden boxes to decorate, sticker stones for extra decorating, jewelry supplies, and so much more! If you are not in India, don’t worry, you can still order from Let’s Quill On! They ship all around the world. They are currently upgrading their site to make it easier for international customers to pay. If you have any questions, just contact them through their website and they’ll help you out. If you are in the US you can find a few of their more popular products here on Amazon. *note* I am an affiliate for Let’s Quill On. That means if you click on the links in this post and make a purchase, I get a small percentage, at no extra cost to you. I was not paid or asked to write this post.